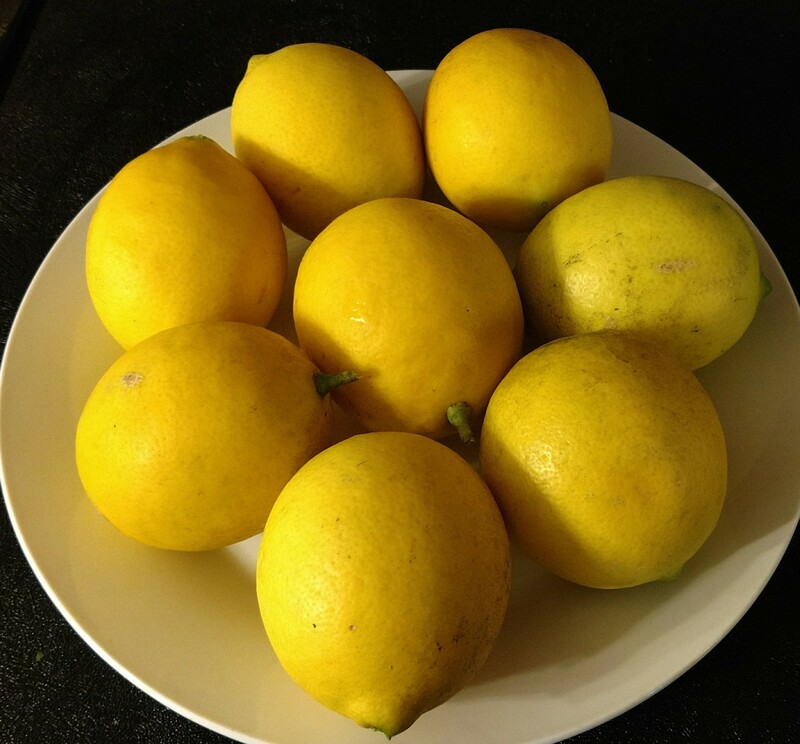 The Meyer lemon has a very thin skin and is, therefore, not suitable for long-term storage – the lemons generally will not last more than 10 days to two weeks before degrading. Since storage is difficult, we often give away many lemons, and we started juicing and freezing that juice in ice trays – the cubes can be thawed for fresh lemon juice, or added to a glass of tea, or even use to make fresh lemonade. Unfortunately, our freezer space is very limited. We often leave lemons on the tree, and pick them “as needed” – especially since our winters are very mild (rarely do our temperatures dipped below about 28°F). When temperatures dip below freezing, we cover the tree with a tarp, and wait for those warmer days that are surely to come. This year, however, a severe freeze three weeks ago resulted in about two thirds of the lemons being destroyed – despite the use of a tarp. Due to the loss of so many lemons, it became obvious that we need additional ways to store this wonderful fruit! 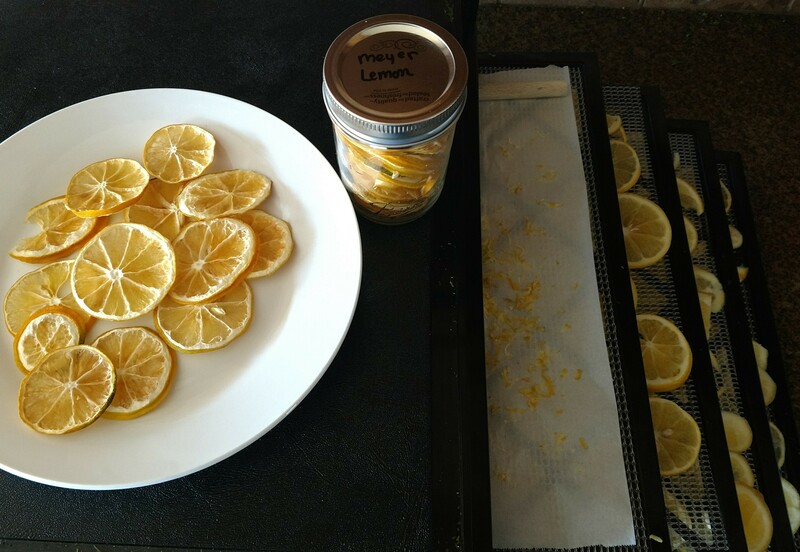 This year, I decided to try something new – dehydrating the lemons. Slice lemons about ¼ inch thick and place on dehydrator trays for 12 to 14 hours at 125°F – until they are completely dried. 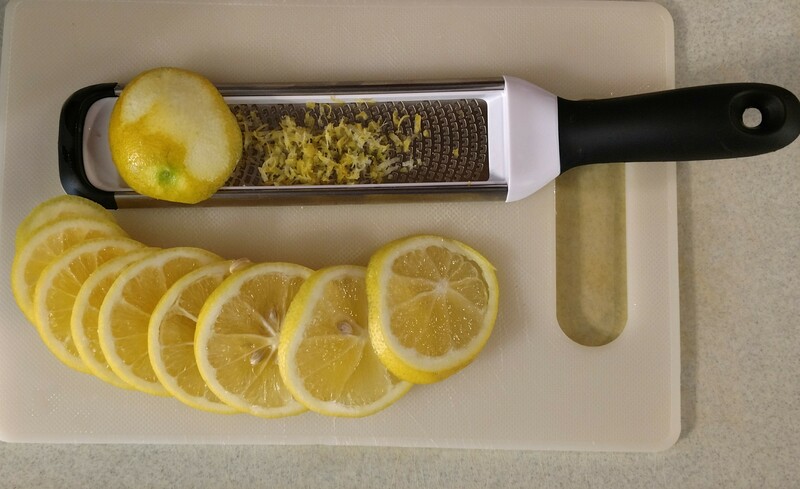 Create lemon zest from the ends of the lemon — I did this before I started slicing as it makes the process just a bit easier! Once dry, the slices can be placed into canning jars for storage (for long-term storage, use jars that allow one to pull the vacuum and remove air). The slices can be used in a few ways. First, add one or two to a class of tea, soda, water, etc. Second, add one or two slices plus 1/2 to 1 teaspoon of honey to about 8 ounces of hot water – the lemon slices re-hydrate quickly, usually in about two minutes or less. ENJOY! PS: This fruit is a result of a cross between an orange and a lemon. As a consequence, the juice is less acidic and slightly sweeter than what we consider to be a “true” lemon.